Like most new business projects, it started with an email from someone we didn’t know. A simple question along the lines of, “We’ve seen your new Stromberg 97. Can you make us some new Stromberg EX-2 carburetors for Auburn V12.” Like most of the answers we give, it was a “yes but…” kind of response. As in, Yes, we can…But have you seen the cost of zinc die-cast tooling lately… and how many do you want? To cut a long story short, we have made what must be one of the first short-run reproduction carburetors ever. The super rare (as in pretty much unobtainium) single barrel Stromberg EX-2, as used exclusively on 1933-4 Auburn V12. How did we do it? Mostly with modern prototyping technologies, starting with a real and hugely valuable original. The key parts are the cast iron bases (right and left handed, as the V12 uses two carbs), the bowl section and the stamped steel lid for the float chamber. First we stripped it down and worked out exactly how all the circuits worked. Then we 3D scanned it to give us help with the shapes, and measured every dimension, thread and circuit by hand. Then we built complete new 3D models in Solidworks – of all four pieces – adapting the design where we could to use Stromberg 97 parts inside where they were compatible, did a better job and avoided us making even more short-run (ie expensive) parts. The moulds for the cast iron bases were made using modern resin tooling – nothing too taxing there. The same with the float chamber lids, though this was special short-run press tooling, finished off with a one-off marking tool to press the lettering, and a little turned breather riveted on just before paint. The bowl castings though, are very special. In a nutshell, with zinc die-cast tooling prohibitively expensive (unless you’re making many thousands), we turned to short run prototype investment casting using 3D-printed resin SLA models as the basis for our tooling. That’s the translucent white thing in our pictures. 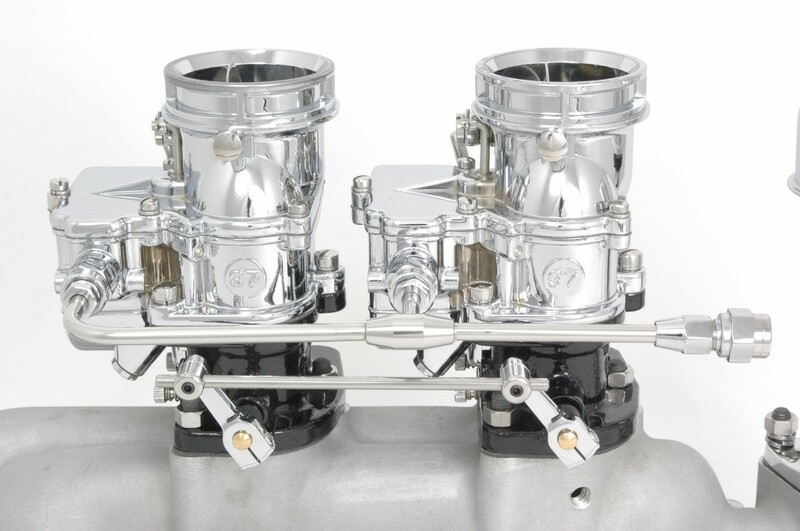 Through a series of positive and negative moulds, and careful accounting for shrinkage and expansion, our supplier (ie someone far smarter than us) made beautiful new Auburn V12 carburetor bowls with incredible correct detail and surface finish. It didn’t quite finish there though, as we also completed the base castings with EX-2-specific shafts, throttle brackets, screws, gaskets and throttle plates. We then fitted all the parts from an original EX-2 into the new castings, proving how good the reproductions are. After CNC machining, painting, endless checks and running tests, we shipped the first pair to our customer in Indiana, USA, and by the time we got ourselves out there in person, the guys had them mounted on the Auburn V12 and running up the road. Mission Accomplished. Need a pair for your Auburn V12? You need to speak to Vivian Lavine at Lavine Restorations, 1349 Beech Rd, Nappanee, IN 46550, USA . You can call them on (574) 773-7561. Our Vice President of Moving Media, Piero De Luca has been hard at work again. This time it’s a super-cool video production highlighting our beautiful Stromberg 97 chrome carburetors. Check it out. We’re relaunching our whole TwoStep fuel line range at the moment, with significant price reductions and lot of new products – some available now and more coming soon. Folks have asked about Stromberg fuel lines for flathead Fords without the stock fuel pump for some time, so here we go. These new Stromberg Fuel Lines (Part Numbers 9141-RP and its fully polished brother 9141-RP-P) are designed for use with two 97s and a remote fuel pump, extending the range to include a lot more 2×2 flathead intake manifolds. Here are the highlights. Brass Ford Nut fittings are supplied. 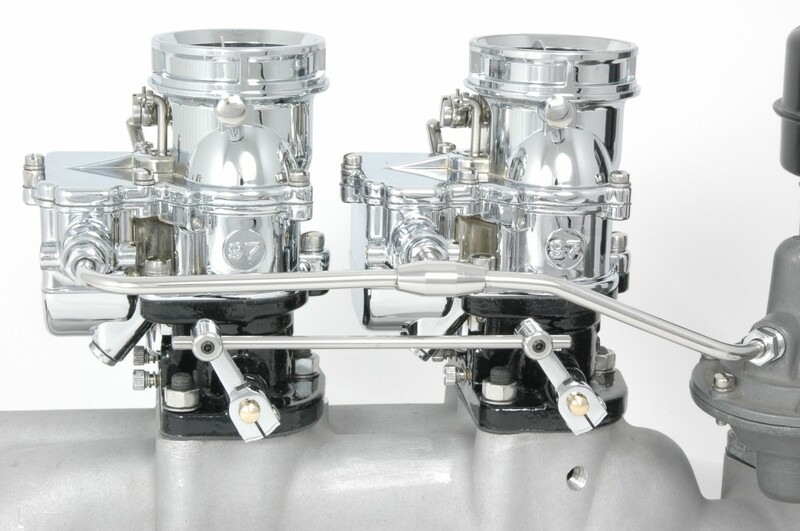 Designed and manufactured exclusively by Stromberg Carburetor, TwoStep Fuel Lines combine super-clean hot rod styling with simple installation. Each kit is supplied ready to install in just two simple steps. TwoStep kits are not a ‘one size fits all’ solution. They’re CAD engineered to fit Stromberg 97, 81 or 48 carburetors on specific intake manifolds. Every Stromberg TwoStep Fuel Line kit comes with full instructions, and further help with selection, installation and tuning is available at our Tech Center. You can find the new pricing details on our website. Click here for Stromberg Fuel line Kits. 9246PRO-KD-CHR 3×2 5-1/2 inch carb spacing. Fits small block Chevy – Offenhauser 3558 and Edelbrock 5414 & 5418 3×2 intakes. 9251PRO-KD-CHR 3×2 4-7/8 inch carb spacing. Fits Offenhauser 3×2 intakes for early overhead valve engines, like Ford Y-block and ’49-’61 Cadillac, (but check carb spacing before ordering). Also used with our 9261-BB Back-bar kit for 6×2 Edelbrock X1 Ram intake. 9253PRO-KD-CHR 3×2 4-3/4 inch carb spacing. Fits Edelbrock 5412 3×2 intake for small block Ford. Fits some Weiand 3×2 intakes for early overhead valve engines (but check carburetor spacing before ordering). Also used with our 9262-BB Back-bar kit for 6×2 Offenhauser Pacesetter 3924 intake. 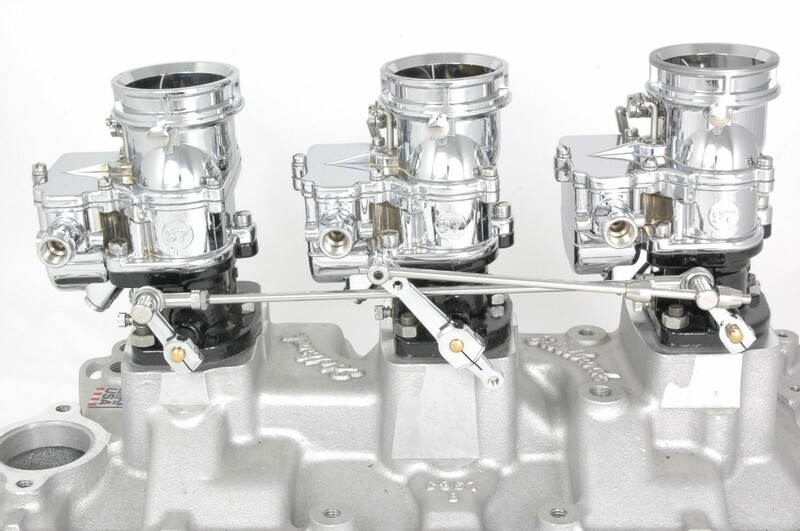 All three are high quality CHROME 3×2 progressive carburetor linkages with auto-trans kickdown capability – an extended center lever with a 1⁄4”UNF thread to accept the special fixing common to most (eg ‘Lokar®’) hot rod auto-trans kickdown cable kits. 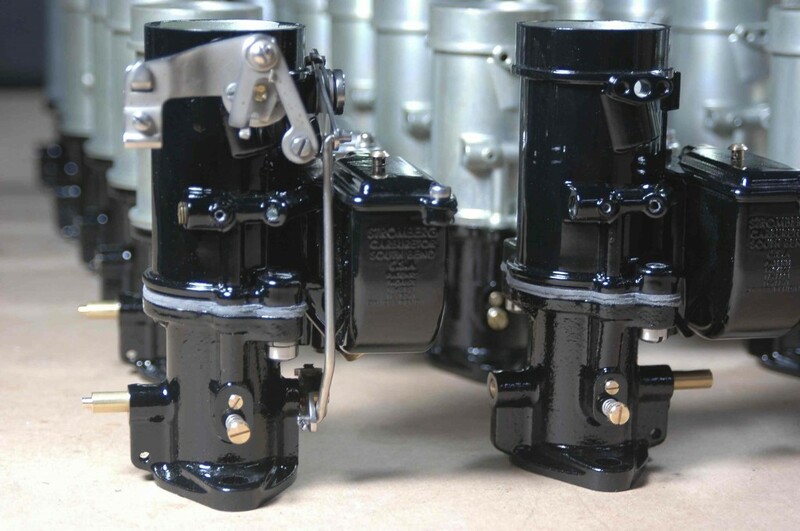 Stromberg KD linkages are designed to work with the Stromberg Cable Throttle Bracket (9136K), which provides a fixing hole for the small cable mount extension bracket supplied with most hot rod kickdown cable kits. To find out more, you’ll find all three kits on the Stromberg website. Click here.